Please select an option Camo print Beige Navy Sage green Pink Please select a color. Live in total comfort this spring and summer! 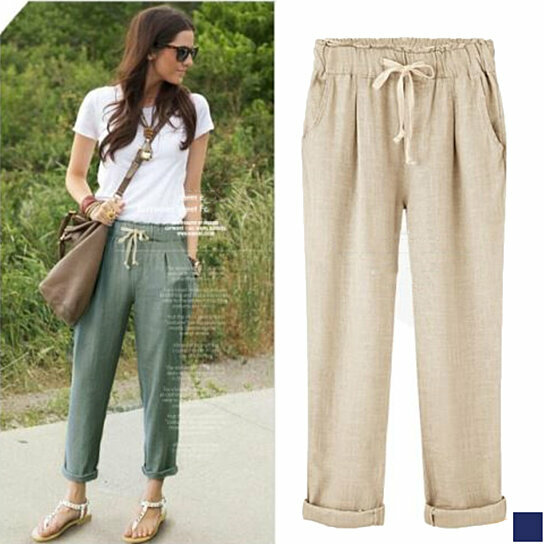 These breezy yet sophisticated pants feature an elastic tie-waistband, cuff detail, and two functional side pockets. Breathable cotton and a loose fit keeps you cool and comfortable. Pair it with a basic tee or button up, sandals, and your favorite summer accessories. Please review measurements below for best fit:Small (Sizes 4-6) -- Bust: 33.5" - 34.5" Waist: 25"-26" Hips: 36"-37"
Medium (Sizes 8-10) -- Bust: 35.5" - 36.5" Waist: 27.28" Hips: 38"-39"
Large (Sizes 12-14) -- Bust: 38"-39.5" Waist: 29.5" - 31" Hips: 40.5" - 42"
XLarge (Size 16) -- Bust: 41" Waist: 32.5" Hips: 43.5"